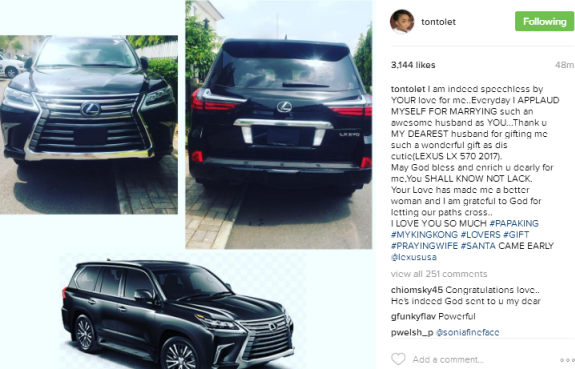 The actress on social media, shared the photos of the car above and wrote"I am indeed speechless by your love for me..Everyday I applaud myself for marrying such an awesome husband as you....Thank u my dearest husband for gifting me such a wonderful gift as dis cutie(Lexus LX 570 2017). May God bless and enrich u dearly for me,You SHALL KNOW NOT LACK. Your Love has made me a better woman and I am grateful to God for letting our paths cross..I LOVE YOU SO MUCH #PAPAKING#MYKINGKONG #LOVERS #GIFT#PRAYINGWIFE #SANTA CAME EARLY@lexususa".